I was rather surprised by the news that there will be a Game of Thrones themed version of Settlers of Catan. But it’s true! Fantasy Flight Games will be releasing A Game of Thrones Catan: Brotherhood of the Watch this year. It has elements of the original Catan game, but it sure seems to take the game a step further. I’m curious what the critics will say about this one! 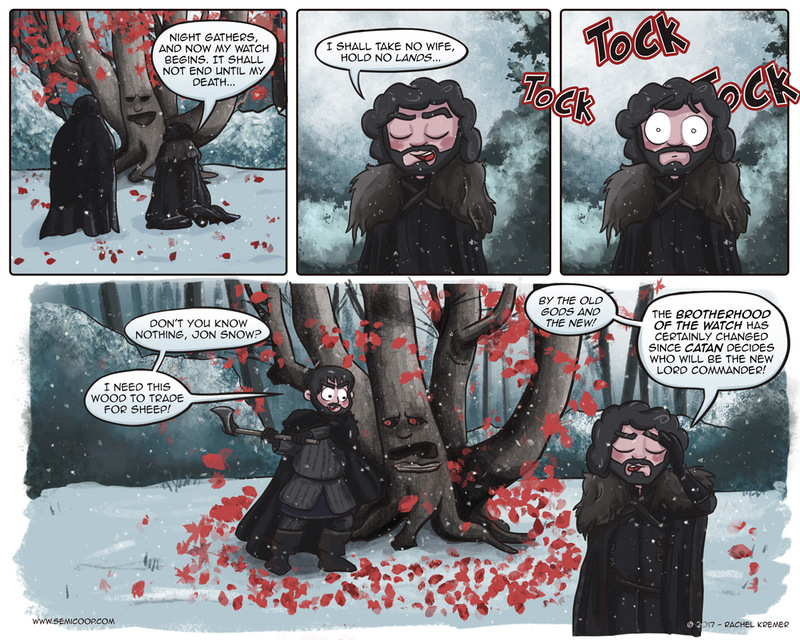 For us, this was a great excuse to make a Game of Thrones themed comic. 😉 I mean… if there ever was a moment to publish one this would be it, right? And no spoilers about the new episode in the comments, please, thank you! Last Saturday we decided to take a full day off after these hectic weeks we’ve been having. We sat down at our FLGS and played their demo version of Splendor! We once played the app version of Splendor, but it didn’t really stick. So we thought it would be fun to give this classic and popular game another chance ‘in the flesh’. And it was great fun! We enjoyed it better as a physical game than the digital version. We realized we never really taken a good look at their collection of demo games, so now we made a list of which of games we’d like to try, but don’t really feel like we need to own. Or do we? We would just like to try them first. So we’ll be hanging around there more often this summer I think. Do you ever play demo games at a games store before deciding to buy something? My process of “investigation” is 1) look up on BoardGameGeek.com, 2) look up on YouTube, 3) download and read pdf of rules. That being said, I definitely recommend taking advantage of demo games if they – and friends with which to play – are available to you. I’ve learned a lot about how certain mechanics or themes or styles of games affect certain friends – avoid “take that” games with Megan, or there’s a point where Tom gets fed up with “too much” randomization – and demo plays will quickly reveal these qualities. Also, when I got to the third panel, I was convinced this comic was going to have some sort of TOC TOC WOODMAN/CLICK CLACK LUMBERJACK joke … y’know, like you’re mixing games again similar to your Flick ‘Em Up!/Agricola/Evolution fiasco. Ha!